Yearly Meeting appoints standing committees which are accountable to Yearly Meeting in session. Meeting for Sufferings (see chapter 7) does not have committees which are accountable to it, but it may appoint working groups. 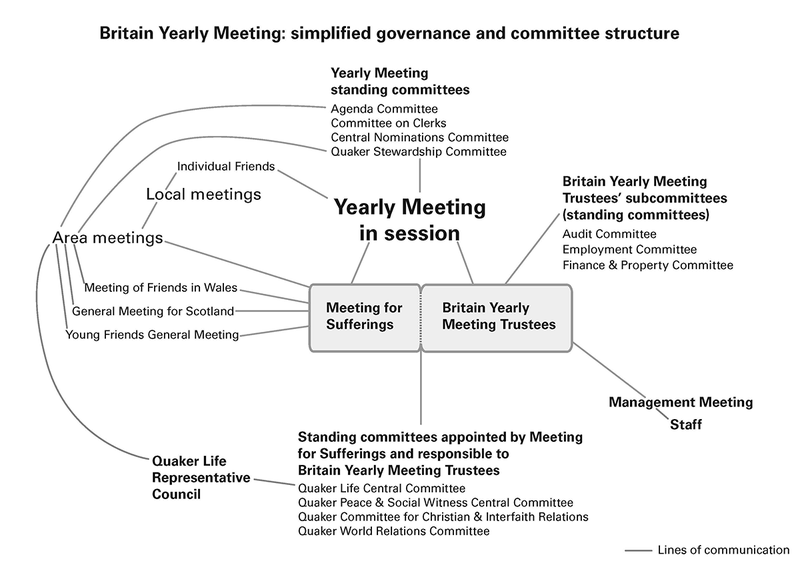 The diagram shows a simplified governance and committee structure of the Yearly Meeting at the beginning of 2013, indicating the lines of communication between units. Friends accepting service on committees, whether by local nomination or not, might usefully share with their area meeting the interests and concerns which are claiming their committee’s attention. Spoken reports may be preferable to written ones, especially for transmitting experience in a concise and lively way. Clerks might encourage the sensitive sharing of experience, rather than mere reporting.